A linear function in the x,y plane can be written as y = mx + b. For example, the linear function y = 2x +3, has the values m = 2 and b = 3. We can plot this point (2,3) in the m,b plane. Every linear function in the x,y plane corresponds to a point in the m,b plane. Check the 'get started' box to experiment and see how this works. 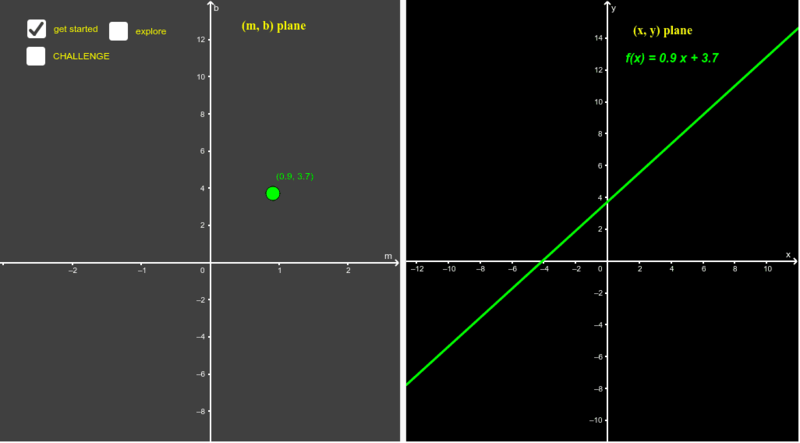 Check the 'explore' box to experiment with intersecting linear functions in the x,y plane Check the CHALLENGE box - a dotted line will appear in the m,b plane. You can position this dotted line by dragging the two rings. After you have placed the dotted line where you want it, you can drag the large dot along the dotted line. Each position of the large dot has a set of coordinates (m,b) and therefore corresponds to a linear function in the x,y plane. As the dot moves along the dotted line you will notice that all the linear functions in the x,y plane pass through a single point. CHALLENGE: How is the position of the fixed point in the x,y plane related to the way you placed the dotted line in the m,b plane? What questions could / would you ask your students based on this applet?